It might be seen as a little unusual for a company called Everything Dinosaur to review a model of a horse, after all, we are usually preoccupied with writing reviews of replicas from the Collecta Prehistoric Life Collection, but we are making an exception when it comes to Collecta’s model of Przewalski’s horse as this animal has remained unchanged for thousands of years and it would have been very familiar to Stone Age Europeans and Asians. First lets deal with the pronunciation, as the name is a little difficult to pronounce even for those of us who have to cope with the Dinosauria, this horse is called Pre-zal-ski’s horse, or more commonly and appropriately She-val-ski’s horse. Of course you could just refer to this animal as the Mongolian wild horse or indeed use the Mongolian name which is the Takhi (tack-ee). Stone Age survivor being slowly re-introduced to the wild. Przewalski’s horse is regarded as the only true wild horse in existence, although it was believed to have died out in the wild, small populations have been re-introduced into Russia, Mongolia and China after a successful zoo based breeding and re-introduction programme. These horses are stocky, more so than most types of domesticated horses. They also have shorter legs. Average height is around 13 hands high, around 130 centimetres tall when measured from the ground just behind the front fore leg up to the withers (the top of the shoulder where the neck joins the body). The model measures a little over 16 and a half centimetres in length and the measurement from the ground to the withers is around 7 centimetres, so we estimate that this Collecta horse model is made in approximately 1:20 scale, so it works well with other recently introduced Collecta prehistoric animals such as the Deinotherium , the Megacerops and the Woolly Mammoth. 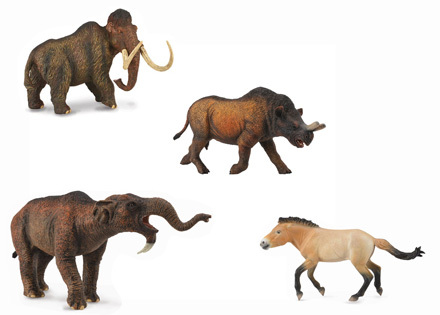 Part of the Collecta range of animal models. This model of Przewalski’s horse is part of the horse model series designed by Californian based sculptor Deborah McDermott and is included in the Collecta horse model collection. The coat is a dun colour, with a dark mane that stands proud of the neckline, there is black colouration on the lower legs and a long black tail. Cave paintings discovered in France and Spain depict drawings of very similar looking horses. This suggests that these types of animals were a common sight in western Europe during the Upper Palaeolithic. With this horse believed to be extinct in the wild, an international foundation was set up in 1977 to co-ordinate and manage a zoo-based breeding programme using animals that were descended from wild populations captured in the early 20th Century. As the population slowly built up, herds were established in several specialised reserves and in 1992 the first Przewalski’s horses were reintroduced into Mongolia. A number of national parks and preserves have been established and it is estimated that the Przewalski’s horse wild population now numbers several thousand. This is a well-crafted, hand-painted replica of Przewalski’s horse, a model that works well with the other prehistoric mammals in the Collecta Prehistoric Life model series.